To honor Elaine for becoming like a daughter to him, Mr. Pitt amends his will to include Elaine as a beneficiary. 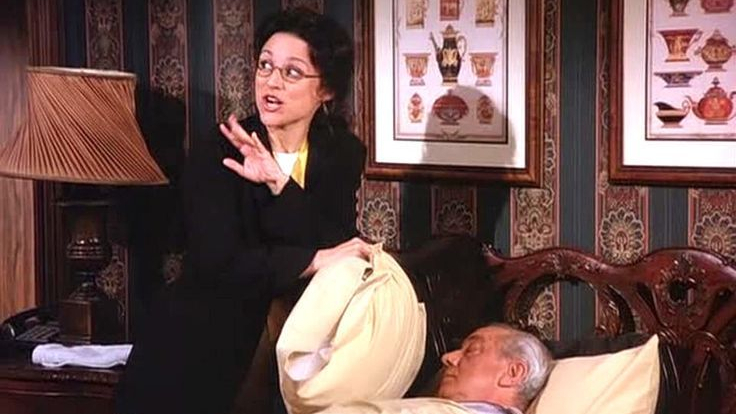 Later in the episode though though, Mr. Pitt fires Elaine, and implies that he is taking her out of the will. Did Mr. Pitt properly amend his will to include Elaine? Did Mr. Pitt properly remove Elaine from his will? Wills are like heart medication, they must be executed under precise rules and directions. To create a valid will, one must have: 1) intent, 2) capacity, and 3) act in accordance with the governing statutes. All of these elements seem to be present. Mr. Pitt specifically told Elaine that he is putting her in his will, thereby demonstrating his intent. And, 3D printed art aside, he certainly seems to be of sound mind as well which shows that he has the necessary capacity to draft a will. Lastly, we can assume that his lawyer, Lenore Walker, made sure he abided by the governing statutes. Therefore, Mr. Pitt has fulfilled all of the prerequisites for creating a valid will. It is unclear though if Elaine being added to the will via a codicil (document made after the will that either adds, explains, or deletes from the already created will), or if Mr. Pitt is creating an entirely new will with Elaine listed as a beneficiary? Since Mr. Pitt said he “amended” his will to include Elaine, it sounds as if he is mixing her into an already existing will; like cold medicine and heart medication. This indicates that he is adding Elaine as a beneficiary via a codicil. However, this would not bode well for her. A codicil must be executed the same way as an “attested will,” meaning that two witnesses must sign the will after seeing the testator, Mr. Pitt in this case, sign the will. When Mr. Pitt signs the document and then tells Elaine that he has amended his will, there are no witnesses around. It is possible that Mr. Pitt amended the will earlier and is only notifying Elaine now, but since he says “just” it is heavily implied that he has just done it right then and there. If that is the case, then no witnesses saw him create this new document (the codicil) and it would not be valid. But all hope is not lost for Elaine. Mr. Pitt could have drafted a “holographic” (not 3D) codicil, which is just a fancy way of saying that the codicil (or entire will, which can also be holographic) was handwritten. This kind of codicil does not require any witnesses because the testator’s handwriting serves as a kind of self-verifying witness. Since Mr. Pitt was writing when Elaine came in, it is certainly possible that he had been handwriting the entire codicil. Therefore, if this is a holographic codicil, Elaine would be included in the will as a beneficiary. However, the facts here become quite confusing, as halfway through the episode Mr. Pitt announces to his lawyer Lenore Walker “this is the girl I want to put in my will” in reference to Elaine. If he still wants to add her, then why did he say earlier that he had just amended his will to include Elaine? One way to make sense of this is that Mr. Pitt did in fact amend his will, but then once he fell ill he became delirious and didn’t realize what he had done. While this would conceivably keep Elaine in the will, it does open an avenue to argue that Mr. Pitt lacked the necessary testamentary capacity, since he can’t seem to tell the past from the future. Nevertheless, this deliriousness came after he already said he added her to the will. Therefore, while Lenore Walker might try to argue otherwise, we can safely assume he had the requisite capacity at that time, and only later did he lose that necessary capacity. Ultimately though Elaine may lose out as being a beneficiary for two distinct reasons. The first is the principle of undue influence. This is where a beneficiary overcame the testator’s free will by convincing him to bequest something and to someone he may not have freely wanted to. Lenore Walker is clearly distrustful of Elaine, and as his estate lawyer she might try to argue that Elaine convinced him against his better judgment to add her to the will. The second problem could be the “Slayer Rule.” This rule states that if a beneficiary participates in the felonious killing of the testator, that beneficiary will not be able to collect under the will. Lenore Walker will certainly try to argue that Elaine and Jerry Seinfeld tried to kill Mr. Pitt, and therefore the Slayer Rule should exclude Elaine. But, since Jerry did not successfully kill Mr. Pitt (not that he ever even wanted to), the rule would almost certainly not apply here. A final thing to consider is that if Elaine was actually legally added to the will, then in order to take her out Mr. Pitt would have to draft an entirely new will or codicil. Elaine could then try to argue that Lenore Walker exerted undue influence on him to take her out of the will, or that he doesn’t have proper capacity to make any changes since he seems to be delirious at times. Either way, simply firing Elaine would not remove her from the will. All in all, The Diplomat’s Club presents a confusing set of facts as to whether Elaine was ever in the will in the first place and whether she was ever taken out. And with these kinds of fact based determinations, we would need to leave that up to the jury. No more questions!